Passengers evacuate US Airways Flight 1702 after the pilot was forced to abort takeoff shortly after 6 p.m., Thursday, March 13, 2014, in Philadelphia. The Airbus A320 jet, bound for Fort Lauderdale, Fla., was carrying 149 passengers and five crew members. This photo of the event was posted on Facebook. New information on a US Airways jetliner crash March 13 in Philadelphia indicates that the accident was caused by pilot error, according to federal documents cited on an aviation news website. Initial reports were that Flight 1702, bound for Fort Lauderdale, Fla., had blown a tire in the front landing gear, causing pilots to abort the takeoff, and that gusting winds might have played a role. 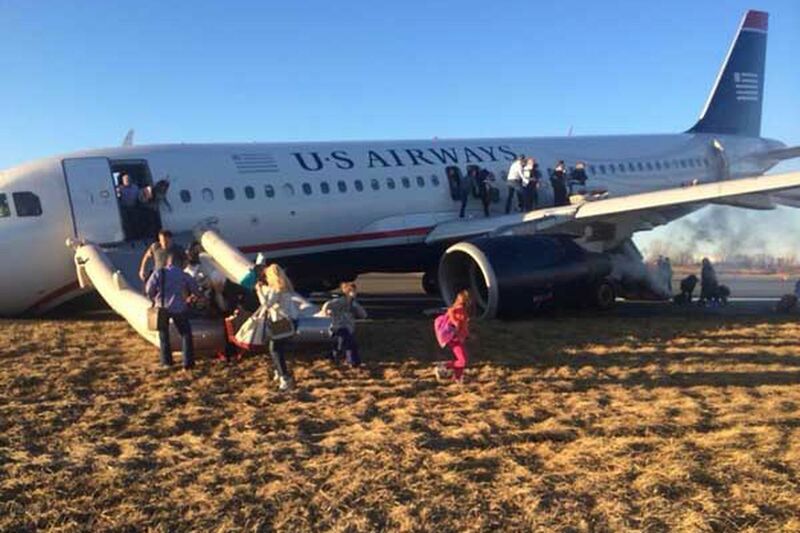 The jet skidded nose-down to a stop about 6:20 p.m. at Philadelphia International Airport, and the 149 passengers and five crew were evacuated, with no serious injuries reported at the time. The National Transportation Safety Board and the Federal Aviation Administration then began an investigation, which is continuing. Soon after the accident, US Airways' statement changed, referring only to a collapsed nose gear with no mention of a blown tire. That pilot error may have played a role was reported last month by Jonathan C. Reiter, a New York aviation lawyer who filed a Freedom of Information Act request from the FAA. Reiter later issued a news release citing the FAA documents on behalf of a client he says was injured in the incident. Reiter could not be reached Thursday for comment. Flightglobal.com, an aviation news and information website, picked up on the news release and filed its own request before publishing a post. Then NBC10 in Philadelphia broadcast its version of the story on New Year's Eve. Internal FAA documents obtained by Flightglobal.com indicate that before the take-off, the crew failed to enter data into the computer that was needed to calculate power settings for takeoff. The pilot and copilot "continued the take-off roll amid audible warnings urging them to pull back the throttles," Flightglobal.com's Jon Hemmerdinger wrote. "The captain said, 'We'll get that straight when we get airborne,' " the website reported, based on an FAA accident report and copies of notes taken by FAA inspectors on the scene. The FAA documents said the captain flew too soon after taking prescription medications. The FAA report noted the captain reported for duty 45 hours after taking two prescription medications: midazolam, a sedating drug, and fentanyl, a powerful painkiller "used as part of medical procedures," the website said. Based on FAA notes, the captain took the medications for a stress test March 11, and pilots are instructed to not fly after taking such medicines for a period equal to five times the medication's half-life. That period was 60 hours for the captain, Flightglobal.com reported, citing the FAA report. The website also said that before take-off, the captain noticed that the wrong departure runway was displayed on the navigation screen. The copilot corrected it, but failed to reenter other parameters related to take-off speed. As a result, when the captain advanced the throttles, a warning chime sounded, and a screen instructed him to set the throttles to take-off power. Flightglobal.com said the copilot read the first part of the message aloud, but not the instruction to increase power. The captain responded that the "power is set," while the aircraft sped along the runway. Then an audible warning sounded, "Retard, retard, retard," telling the pilots to idle the throttles, the FAA said. The first officer told the captain she had never heard that warning during takeoff. "We'll get that straight when we get airborne," the captain responded, according to Flightglobal.com. The aircraft lifted off, and the FAA said the captain had the perception that the aircraft was unsafe to fly and moved the throttle to the idle position. This caused the aircraft tail to strike the runway, driving the nose landing gear into the runway, and causing the tires to blow out. The airplane skidded down the runway about 2,000 feet. In his news release, Reiter, the aviation lawyer, said, "While the NTSB has not yet issued its final report, the documents obtained thus far from the FAA clearly indicate that the flight crew negligently failed to ensure that take-off performance data was configured properly prior to departure and failed to keep the aircraft under proper control during an aborted take-off." The FAA declined Thursday to release its documents without a Freedom on Information Act request. American Airlines, which has merged with US Airways, also declined to comment while the NTSB investigation was continuing, said airline spokeswoman Victoria Lupica. Passengers aboard the Airbus A320 described a chaotic and frightening scene that night and some said the worst part was waiting 30 to 40 minutes in the cold for buses to take them to the terminal.